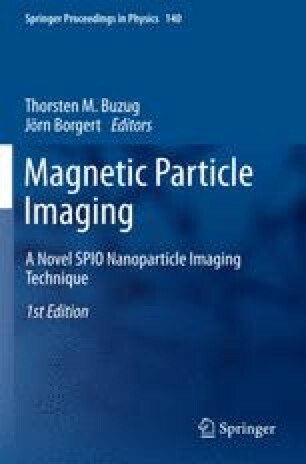 Magnetic Particle Imaging (MPI), a method that takes advantage of the non-linear magnetization curve of superparamagnetic iron oxide (SPIO) nanoparticles, promises to deliver high spatial and temporal resolution with a sensitivity exceeding that of magnetic resonance imaging (MRI). However, SPIO nanoparticles have a short blood retention time which limits the applicability of such compounds for MPI. We propose the use of red blood cells (RBCs) as carriers of SPIO nanoparticles to realize a blood pool tracer with longer blood retention time. Previously, we described a method of SPIO nanoparticle encapsulation into RBCs. The loading procedure consists of a hypotonic dialysis of cells in the presence of magnetic nanoparticles and successive resealing and reannealing of cells using isotonic solutions. Here, we report for the first time Magnetic Particle Spectroscopy (MPS) and MPI results obtained after intravenous administration of murine Resovist-loaded RBCs in an in vivo MPI experiment.